Happy First “Out of the Box” of 2016 and award season is taking over with a dash of the winter TCA and the first stunning magazine cover of the year. Now is not the time to go big on the red carpet because there’s still plenty of dress/tux wearing time to go, but there is plenty to love about this week’s offerings including the two big trends; lots of green and pattern clashing. I mentioned earlier this week that we would be seeing a lot more of Brie Larson on here and I’m making good on this promise with a double outfit entry from Larson. First up at the Palm Springs International Film Festival she wore this simple emerald green Jason Wu dress to pick up the Breakthrough Performance Award. Accompanied by her Room co-star Jacob Tremblay showing that being a kid doesn’t mean you can’t look dapper (and super adorable to boot) in a tux. Another award recipient at the Palm Springs festivities and Saoirse Ronan took home the International Star Award for her magnificent turn in Brooklyn. Here is where the pattern clashing might enter ‘too much’ territory, but I love this Duro Olowu frock and it is the right amount of chaos for me especially as she paired it with just as bright orange sandals. There’s nothing beige about this look. Back to Brie Larson and this Giambattista Valli Haute Couture dress mixes pattern and texture in a way that shouldn’t work, but does (although I have a feeling there will be some who disagree with me on this one). It’s like someone deep dived into Alice in Wonderland and came up with this. More emerald green and it might be a safe bet pairing this color with a redhead, but it doesn’t stop it being a winning formula as Jessica Chastain demonstrates at the National Board of Review Gala in satin Carl Kapp. Looking super loved up on the NBR red carpet and showing that a black dress can be the killer option is Maggie Gyllenhaal with husband Peter Sarsgaard. Her hair looks fantastic and The Row frock blends 30s and 70s cool. Over at the People’s Choice Awards (which always makes me think of this Comeback episode) and brightening up proceedings are another TV Ate My Wardrobe couple fave; Claire Danes and Hugh Dancy always look great together even if his haircut is a little too short for my taste. I assume it is for his new show The Path, but I miss his Will Graham slight unruly wave. Danes looks fabulous in metallic Burberry and I guess this will have to make up for the lack of Golden Globes nomination and therefore non-red carpet appearance this weekend. One final green entry and another redhead in this color and Julianne Moore looks casual cool at the New York Film Critics’ Circle Awards presenting Kristen Stewart – slaying in Chanel leather and lace – with Best Supporting Actress for Clouds of Sils Maria. Over at Vulture they present the case of why this pair are the BFFs we never knew we wanted and yep I am down with that. 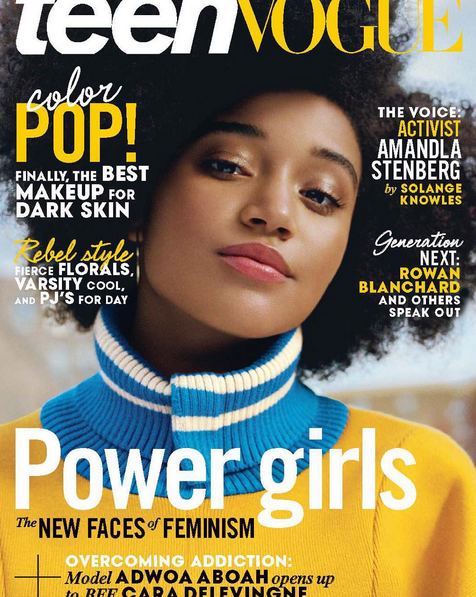 Amandla Stenberg covers the new issue of Teen Vogue and it is both a fantastic photo editorial and conversation with Solange Knowles discussing her school video project on cultural appropriation “Don’t Cash Crop My Cornrows,” which went viral and made sure people knew Stenberg was someone to pay attention to. They also talk about the horrific comments that were made when she was cast in The Hunger Games, feeling comfortable in her own skin, besties Kiernan Shipka, Willow Smith and Tavi Gevinson, plus future projects. To read the full interview and see more fabulous photos from the shoot head here. This is better than any recent Vogue cover I can remember and their editorial team should take note. Because I’m not going to deny you Scott Speedman’s bare ankles at the Animal Kingdom TCA panel. A slightly random TCA note to end on, but here is Constance Zimmer (who was there on UnREAL duty – so excited for S2) looking as happy as you should be when playing with a dog. I also appreciate the close up on those heels which glam up her outfit.